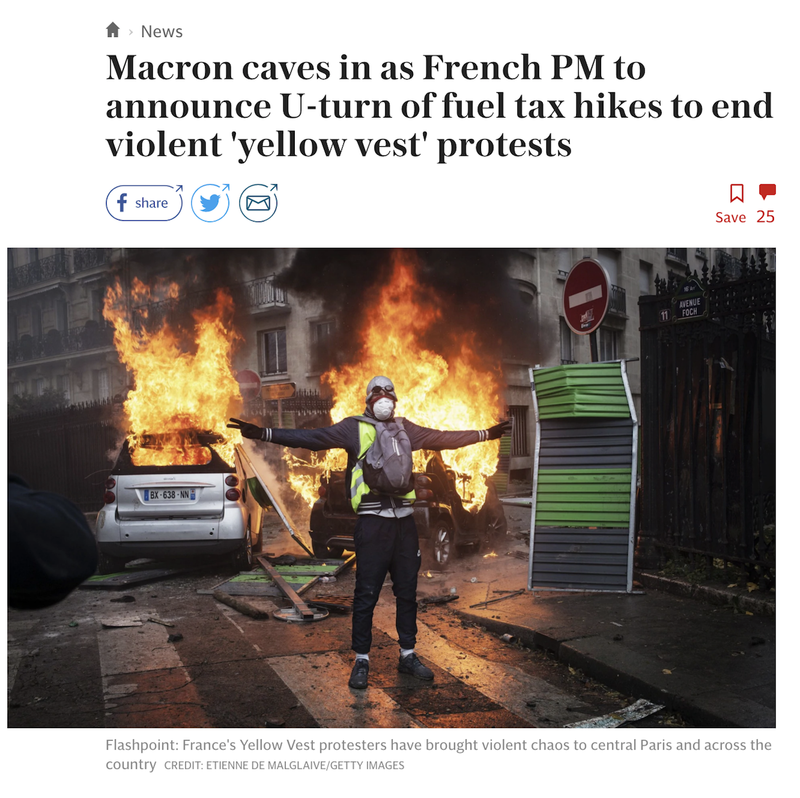 4) Carbon Tax Moratorium: "This Is Just A First Step "
The increase in the carbon tax on fuels will be suspended for six months while the rise of electricity and gas tariffs is suspended "during the winter," the [French] Prime Minister announced on Tuesday morning, three days after protests by the "yellow vests were disrupted by violence. "No tax deserves to endanger the unity of the Nation". Nearly three weeks after the first day of national protests by the "yellow vests", and three days after serious violence in Paris and the region, the Prime Minister announced new measures on television in an effort to appease the public and restore "social peace." The increase of the carbon tax on gasoline, fuel oil and diesel was scheduled for 1 January. The Prime Minister has now "suspended the increase for six months," conceding to the calls for a moratorium demanded by opponents of Emmanuel Macron. Suspension of the rise in electricity and gas rates "during the winter"
To appease the anger that now extends well beyond the single carbon tax, Édouard Philippe also announced that "electricity and gas rates will not increase during the time of the consultation". In other words, the automatically scheduled increase on January 1st of each year is suspended "during the coming winter". According to estimates from various media, such as Le Parisien and L'Opinion in particular, the application of the regulatory formula would have led to an increase of 2.3% or even 3% to 4%. More than 25 million households are affected. Macron made the decision to suspend the 2019 fuel tax hikes late on Monday, the sources said, after his government spent the day meeting with leaders from all of France's political parties. Benjamin Cauchy, a leader of the "free yellow vests", has welcomed as the government's announcement of a moratorium on the carbon tax as a first step, but said that the demands of the protest movement are much wider called for continued, peaceful protests next Saturday. 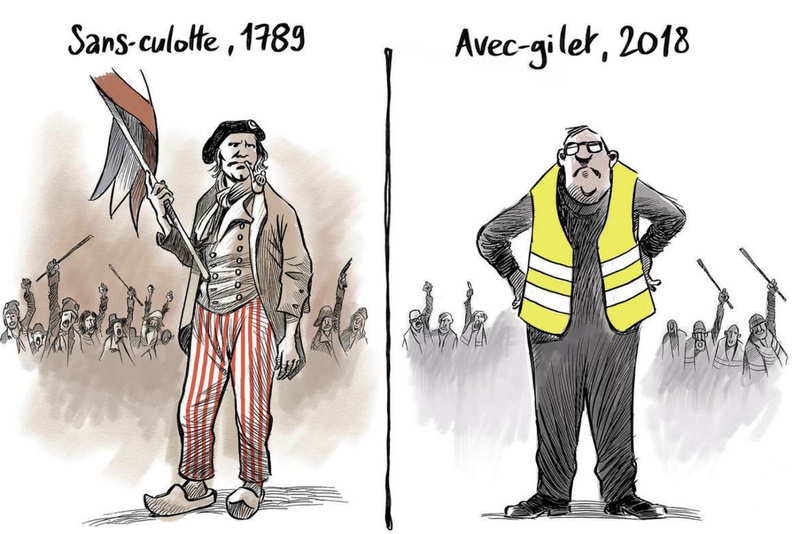 Given the strong public support, Benjamin Cauchy is certain that the "yellow vests" will change the government's stance. "We are preparing for a political transition much more than an ecological transition," the activist said. As things stand today, there is clearly no global consensus on a climate catastrophe, or on the way the world should tackle it. We think the UN should sober up. It is its responsibility to review its climate agenda and change the message. If by the end of the Katowice summit on December 14, there is still no consensus on a plan of action, the UN should pull the plug on its climate agenda.